Had a lot of questions about yesterday’s video, so I’ve attached a PDF to give you the inside scoop on what’s going on. 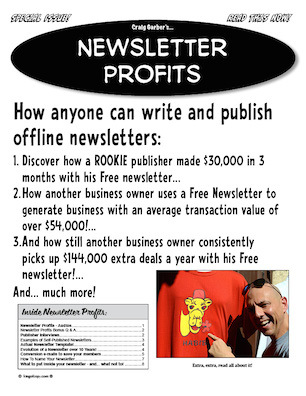 I wanted to give you a sneak preview of the “guts” of the Newsletter Profits program that’s launching next week. It’s a very practical program, easy to follow, and it’s based on my own experience publishing Seductive Selling (my own offline newsletter) monthly, for almost 10 years now. Plus, my experiences in consulting with close to a dozen clients during the last 15 years, who have also published an offline newsletter of their own. Some of these newsletters are free newsletters, others are also paid for subscriptions. You’ll also be hearing from some of these people in this program, on in-depth interviews we conducted.